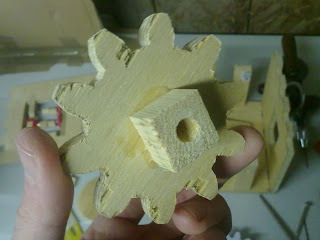 I completed the gears for the Turtle and the Hand. 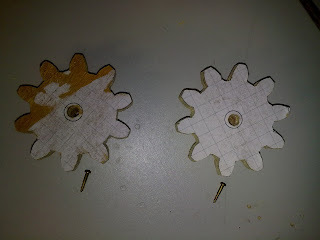 They are made of plywood but the layer split off from the other side of the gears so these will not be the final gears, if I even use them. They mesh nicely and the whole mechanism is working with not too much effort when the springs are attached, but the whole thing runs far too fast so I'm going to have to think about slowing everything down. I might try and use a belt drive. I've been looking at using rubber and found some on eBay. I need some proper rubber glue though. Sadly all these things cost money so that means saving up some. I'm currently saving up for a scroll saw though. If I do use pulleys, I'm not sure that gears will be needed, but it would be a shame to waste them. I'm surprised the gears worked so well. Usually they put a bit of a fight when meshing. One thing I noticed though when everything was up and running. It looks like the mechanism for the turtle's limbs is back to front meaning that the legs will snap out of the shell instead of snapping back into it. I think I'll have to change the position of the lever so that it is above the cam rather than below it. A spring will be needed to pull it down and the cam will need to push it up. 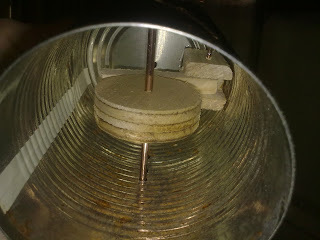 With a spring pulling down,this will "snap" the limbs back into the shell (hopefully). I've also worked a little on the tin can. I have made a lever for linkage to be fixed onto. I might have made it a little short. Luckily, tin cans are abundant in my house so it won't take long to make another if it needs re-doing. The cam also needs shaping to get the desired movement.